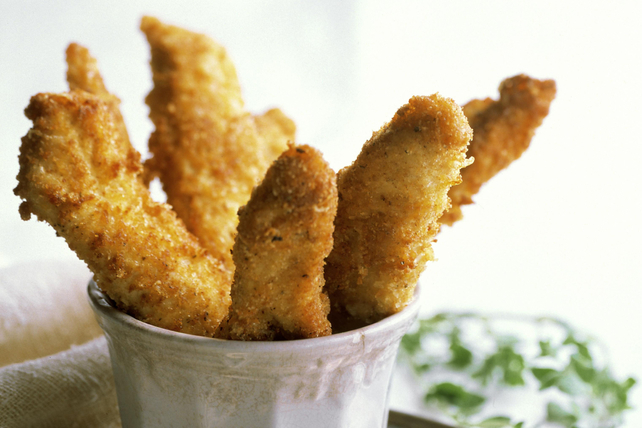 Kids of all ages are sure to enjoy these chicken fingers! Our chicken fingers are super simple to make, and the dipping sauce is the perfect sweet 'n savoury complement to the chicken. Coat chicken with coating mix as directed on package; place in single layer on rimmed baking sheet sprayed with cooking spray. Bake 12 to 14 min. or until done (165°F). Meanwhile, mix remaining ingredients until blended. Serve with cut-up fresh vegetables or a tossed green salad. To instead serve the chicken strips with a honey-Dijon dipping sauce, substitute liquid honey for the maple syrup.